Ever since my brother started using the phrase "I wanna get chocolate wasted" from the movie Grown Ups I've been wanting to make this cake for his birthday. Being a chocoholic myself, I had no trouble coming up with ways to fill this cake with layer upon layer of chocolatey goodness. Just looking at this cake, I think you'll agree that it definitely deserves its name. To create this chocolate beauty, I baked two layers of delicious chocolate cake. Then, I drizzled each cake layer with some Kahlua. I wanted to use chocolate liqueur like Godiva dark chocolate or white chocolate, but all I had on hand was Kahlua, which is a coffee-flavored liqueur and Disaronno, which is an almond-flavored liqueur. Either one would've worked well with the chocolate but since my brother also loves coffee, I decided to go with the Kahlua. Then, I filled and frosted the cake with rich chocolate buttercream. Then, I completely covered the sides of the cake with Ghirardelli semi-sweet chocolate chips. The trick to doing this is to take a handful of chocolate chips and gently press them onto the cake. I placed the cake on a revolving cake stand and I had a large shallow bowl underneath it to catch any chocolate chips that may fall. Next, I topped the cake with an assortment of chocolate candies. 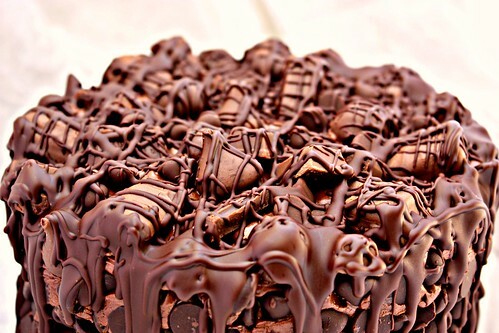 For this cake, I used Hershey Kisses, Hershey bars, Kit Kat bars, Twix bars and Whoppers. With so many candy choices of out there, I'm sure I can make this cake dozens of times and have a different batch of candies to top the cake every time. Last, I drizzled some melted chocolate all over the cake. I crisscrossed the melted chocolate on top and then poured more around the edges of the cake. Think Jackson Pollock. I made sure there was plenty of melted chocolate dripping down the sides of the cake. I think it makes it look even more decadent and mouthwatering. Special thanks to Jef at My Food Geek for sharing some food photography tips with me recently. I tried them out and I'm really happy with how my pictures turned out. Thanks again my friend! Preheat oven to 325 350 F degrees. Grease and dust two to three 8-inch or 9-inch cake pans with flour. To prevent the cake from sticking to the pan, line the bottom with a parchment paper circle. Set aside. Sift together flour, sugar, cocoa powder, baking soda and salt. In a separate mixing bowl, combine milk, butter, honey and vanilla extract. Slowly add the dry ingredients into the milk/butter mixture. Mix until combined. Fold in the semi-sweet chocolate chips. Pour in the batter into prepared cake pans. Bake for 30 to 45 minutes or until a toothpick inserted in the center comes out clean. Remove from oven and wait for about 10 minutes to remove from cake pans and place on a cooling rack. Allow to cool completely before decorating. Note: instead of butter, you can use any allowed margarine, Spectrum organic vegetable shortening, or coconut oil. Instead of milk, you can use rice milk or soy milk. In a large mixing bowl, sift together powdered sugar and cocoa powder. Add the butter, milk and vanilla extract. Using an electric mixer, slowly mix together at a low speed. Once all the ingredients are combined, increase the speed and beat till fluffy. Place the first cake layer on a plate or cake circle. Lightly drizzle with liqueur. Spread an even layer of frosting. Place the second cake layer on top of the frosting. Lightly drizzle with liqueur. Cover the sides and top of the cake with frosting. 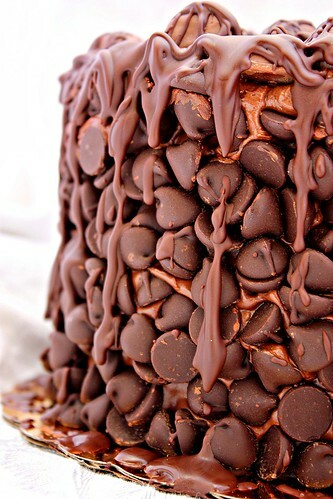 Cover the sides of the cake with semi-sweet chocolate chips and cover the top with assorted chocolate candies. 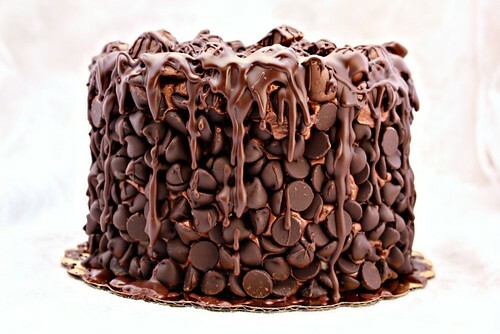 Drizzle the melted chocolate all over the top of the cake and let it drip down the sides of the cake. Ahh this looks sooo crazy. I like it! this is out of the world! that is the most amazing cake ever!!!!! I love how you just went free-for-all on this cake & the craziness is what makes it so beautiful (kinda modern art chocolate wasted). I like the Halloween Candy idea... would make for awesome colors too - beautiful!! 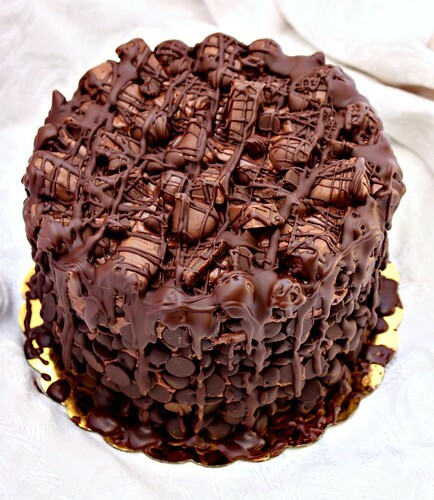 Wow - that is one chocolaty cake! Found this off foodgawker.com. Looks absolutely amazing. Any trick for putting the choc chips on the side of the cake? Did you just put them on one by one? Care to send me a piece ... or 3? If Satan created a cake... this would be it. I want it. A delicious, mouth-watering heart attack, topped with 8locked arteries. WOW this is incredible. All those chocolate chips! You are amazing. 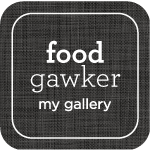 I just found your blog on foodgawker and I LOVE it. OMG!!! I am pinning this and I will make it and then die happy. Thank you. This cake looks AMAZING! I haven't watched Grown ups but I love the phrase! I saw this through TasteSpotting. I just want you to know that you have become a hero of mine. This cake is ridiculous. Wow. That looks to die for. I hope someone gave your brother the gift of a check-up at the dentist for his birthday too. WOW!! I am kind of at a loss for words right now. So much chocolately deliciousness, I just can't get over it! Will you be my sister? Awesome! You have inspired me even though I dont know the basics of baking. But I am going to give it a try no matter what! 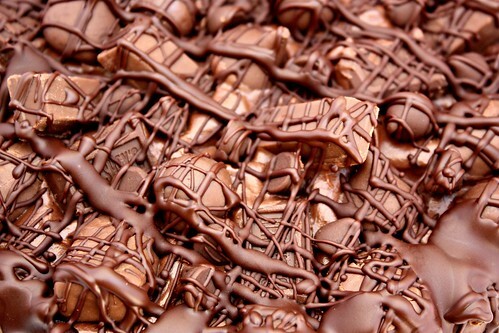 Wow that looks so deadly, I think even my chocoholic friends could not devour that! This looks divine, that seriously looks amazing! Fabulous cake. I've featured it in my inspiring recipes this week http://debskitchencreations.blogspot.com/2011/10/inspiring-recipes-week-ending-161011.html take a look when you've got a moment. Are you effin' kidding me...LOL?! I'm your newest follower! I have to make this cake it looks AMAZING!!! this is awesome beyond words. I thought your Bro. would wash it down with some Chocolate milk. LOL! Oh MY! This cake is unreal and awesome! Oh my gosh. That is a lot of chocolate! I think I'd better stick with the mini cupcakes! I cannot describe how i see this cake! Is amazing! The decoration hold your breath! What a way to go..............looks incredible and decadent in every way!!! Omg - this dessert looks to die for!!! Absolutely loved your blog and thanks for sharing such amazing ideas! Absolutely amazing! I follow your blog since now :D Thanks for sharing all the recipes. i need this in my life. What is the coca powder that you used? I was so proud...I just made it and it was very simple! Great idea, beautiful, and it looks so yummy. Going to bring it for my niece's birthday this afternoon! She spotted it one day and said, "Mom, please, can I have that for my birthday?!" Well, auntie is pulling through! I showed a picture of this cake to my boyfriend and he said "we gotta make that!" so he picked up the ingredients and we baked it yesterday. Not only was it super fun to make, it tasted amazing. The only change I made was using store bought chocolate icing instead of making frosting from scratch. It wasn't nearly as rich as I thought it would be, which is great.. It was so yummy with a big glass of milk :) thank you for the idea! Thanks, this cake inspired one that I made for my friend's 30th bday tonight. I stole the cover it in candy and drizzle it with melted chocolate idea -it looked fantastic (esp since my yummy frosting was not pretty). However I found it such a mess to cut and serve, the chocolate all chunks together, although no one cared by that point. Any tips on how you cut the cake into something that resembled slices? This looks delicious!! I'm a chocolate/peanut butter fan. I may try this but with a peanut butter icing for the top, sides and between the layers. And then continue on with the choc chips, candy and drizzle. Yummmmm! I want to get Chocolatey wasted! @Alaa: I use either Hershey's cocoa powder or Ghiradelli cocoa powder. I'm in the process of making this cake for my blog post tomorrow (it's National Chocolate Cake Day!) and I'll be linking back here. I'm decorating tomorrow, but the cake and frosting are all ready to go now. This may be the best chocolate cake I've ever had. Thank you SO much for this recipe. I can't wait to share it with my readers. This cake is totally blowing my mind! Will... Will you.. marry me? I'm in the process of making this cake...my 2 9" pans are overflowing? What did I do wrong? Thanks for sharing. I have a chocolate lover in my household who has a birthday coming up. I was looking for a decadent chocolate cake to make. Woow!! This is amazing ... Before I was craving chocolate and now Im jus craving a heavenly slice of this wonderfully, amazing, mouth watering chocolate cake. Im in chocolate heaven. So Glad Somewhere in the Middle chose this cake for the Crazy Cooking Challenge, it led me to you! I'm in heaven, I've pinned, liked you on FB and also your newest google friend, I don't want to miss anything, yum! This cake looks amazing! Great job! Quick question: about how much liqueur did you drizzle over each layer? I'm relatively new to baking with alcohol and don't want to over- or under-do it! Im sorry but I made this cake tonight. I spent four hours on it... and it turned out HORRIBLY. it tasted fine but the texture was off.. it shouldve called for eggs or something. it looked more like a brownie and was the texture of a molten cake. it wouldnt come out of the cake pans because it was sticking to the bottom even though i thorougly greased them. Im sorry but you may want to figure out what is wrong or try some eggs. Laura: I usually drizzle 2-3 Tablespoons per cake layer, but it's really up to you if you want less or more alcohol. If you want a non-alcoholic option for drizzling, you can try Hershey's chocolate syrup, Torani flavored syrups (for coffee), or simple syrup (2 parts water 1 part sugar). well now that has left me weak in my knees...and my tongue is slapping my brain out...shame on you...really..that is the most awesome cake I have ever had the pleasure of meeting. Thank you so very much for sharing! I just baked this cake and ran into trouble when I combined the butter, milk and other liquids: the melted butter quickly formed clumps. I threw out this first batch and tried again and it did the same thing, so I decided to keep going. As I added in the dry ingredients it got a little better, but it was still a little clumpy when I poured into the pans. I am hoping that when it baked the butter melted out into the rest of the cake, but haven't cut into it yet. Any thoughts on why this happened? Do you think the cake will still taste okay? I'm making this for my boyfriend this coming weekend. I've never made a cake from scratch before, can I have some hints please??? SO much chocolate. Damn,that looks delicious. The moment I saw this Chocolate Wasted Cake I knew that I had to make it. 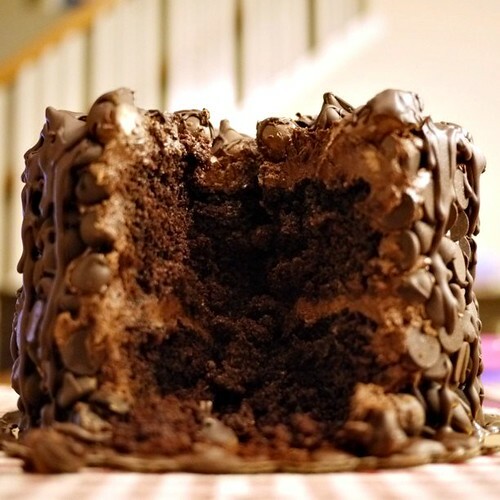 To me there is nothing like a chocolate cake-it is heaven. All others are simply cakes and nothing more. I was not too happy with my first try but my nieces and nephews happily obliged, it was gone in minutes. I made another and it came out perfect so I cut half and stowed it into the back of my fridge and shared the other with my 'wasted buddies'. Thank you for the posting, you are a genius to us chocolate lovers. May I use your picture on Pinterest? I just attempted to make this as my first made from scratch cake.. to say the least it is incredibly sunken, but tastes amazing! This recipe has mistakes. I've been baking for 40 years.....this should specify that if you have an 8 inch pan, you need three or it will overflow. If you have 9 inch pans, they have to be at least 2 inches deep, or you have to use 3 pans, as well. I had the EXACT same experience and ended up tossing both layers and remaking with a recipe I knew would work. What is the point of drizzling the alcohol? I'm new to baking so I'm wondering if it's an important step or whether it could be left out. There are no eggs, is this supposed to be this way? I am making this for our school auction dessert dash this weekend. I have decided to use my favorite box cake mix (boo-hiss!) and follow the rest of your directions with kahlua, frosting, candy and drizzle. It may be the easy way out but with all that chocolate I don't think anyone will complain! I will let you know how much it is sells for! I made this, it turned out perfect and everyone loved it =). Going to make this again tomorrow! Can't get enough of it! This was so great for my chocohaloic sisters birthday! I was pressed for time, so I used 1 box pre-made cake mix (forgive me!!!) and 2-9.5 inch cake pans. Wilton Cake Release is my favorite for getting the cakes not to stick, so I didn't have an issue with sticking. The frosting was delicious! I ended up using a lot more milk to get it to a good consitency. I just kept pouring a little more in at a time, so I'm not sure how much I actual used. I also added a tsp of kaluha to the frosting. I had a little trouble with the chocolate sauce...I ended up using 2/3 cup of cream to get it thin enough to run down the sides. Is it truly 2 cups chips and 2-3 tbs cream? I used chopped heath bars, twix bars, dark hershey kisses, Greenwich bar squares, whoppers, milk duds, and chopped snickers...a great combo. I thinly I will use mini chocolate chips for the sides next time. Great idea...great concept...and a very well received birthday cake!!!! How have I missed your blog for so long? It's fabulous, and this cake is pure genius! Can't wait to make it. I made this cake yesterday for my brother's birthday. He thought it was awesome and my whole family loved it! Because there were no eggs the texture was more fudgey but I thought that was fitting for the concept of a "chocolate wasted cake." The only thing was that my layers fell, which was not a big deal as I just made a double batch of frosting and filled in the spaces. Also, I do not recommend using cream in melted chocolate chips to make the drizzle. The chocolate seizes. I believe that you can use cream with melting or baking chocolate, but for this recipe I had to use vegetable oil. Thanks for this amazing recipe! It was a lot of fun. I believe that she made this recipe without eggs because her kids are allergic to them. You can make the same cake using a different chocolate cake recipe that has eggs if you want to. I believe it is just for more flavor/decadent-ness...you probably don't need to do it if you do not want to. I believe she also suggests adding coffee? I agree that it is best to use 9 inch pans or three 8 inch, which is what I did (it made it appear more spectacular as well to have 3 layers). I let my cakes cool for 15 minutes and then removed them just fine but I did use cake pans with cutter bars so even if they were going to stick I could not tell, they came out very easily. While I had great success with this cake, I do think that next time I will use a chocolate cake recipe that has eggs just so my layers don't sink at all. I am sorry that yours did not turn out like you wanted! Great looking cake - I'm going to make it later today, but am using a different cake recipe, am doing 4 layers(alternating white & milk chocolate cakes), using white & milk chocolate chips, white & milk chocolate butter cream & instead of melted chocolate over the top, I'm going to drizzle it with chocolate sauce. Great idea to build on! WOW! What a delicious masterpice! My 12 yr old daughter talked me into letting her make this and it was amazing! We omitted the alcohol. It was a little sunken and molten like but absolutely perfect!!! Thank you for sharing your recipe.....yummy! I'm sorry you had a bad experience with my cake recipe but thank you for trying it out and recommending to line the cake pans with parchment paper and using three pans. The reason why my cake recipe has no eggs is because my kids have food allergies. Ever since I found this out, I've tried to focus my attention to making allergen-friendly desserts that they could enjoy. Please feel free to use your favorite cake recipe and frosting. The whole point of me making this cake is to show that a beautiful cake doesn't need to have a fancy presentation, it just has to be made with love. I don't mean to sound corny but that's truly how I feel. Hi! Yes, the alcohol is completely optional. You can also try chocolate syrup instead. Wow! That sounds amazing! I love it! wow this looks amazing! I must try this one! you have a beautiful blog by the way, and I have nominated you for the Versatile Blogger Awards! Can you please post how to create the melted chocolate. thanks. I agree with some of the other comments. My cake also fell flat in the center and stuck to the cake pan. The cake tasted delicious but the texture was definitely off. Awesome looking cake though. Unfortunately, I am going to be using boxed mix since my first attempt yesterday was a flop. It is still a great idea for a cake but maybe with a different chocolate cake recipe.Thanks for the inspiration! I agree with some of the other comments. My cake also fell flat in the center and stuck to the cake pan. The cake tasted delicious but the texture was definitely off. Awesome looking cake though. Unfortunately, I am going to be using boxed mix since my first attempt yesterday was a flop. It is still a great idea for a cake but maybe with a different chocolate cake recipe. Thanks for the inspiration! This cake took my breath away when I stumbled upon it online... it's a dreamy mess! Thank you for the inspiration- I'll be making it soon and will be sure to give you credit (assuming it works out for me, of course). Have made it today for my boyfriends birthday using UK chocolate. The only part I didn't do was the melted chocolate... I'm a novice and there is no instruction on how to do this with the cream. This cake looks absolutely amazing - a chocaholic's dream - thank you so much for sharing the recipe. I've pinned it with a link to your site! Just finished making this for my son's bday tomorrow. Had no issues with the recipe at all! Cake is perfectly formed, frosting is beautifully fluffy, drizzle is perfect! I double sifted EVERYTHING. Only difference I made was (since I forgot to let butter warm to room temp) using melted butter in the frosting. Still worked great! I cannot wait to dive into it tomorrow! Thank you for this recipe...was looking for something my chocoholic daughter in law would love, since we celebrate her birthday on Thanksgiving. This looks perfect!! Honestly, (and this is no slight on Americans) Herschey chocolate is revolting. 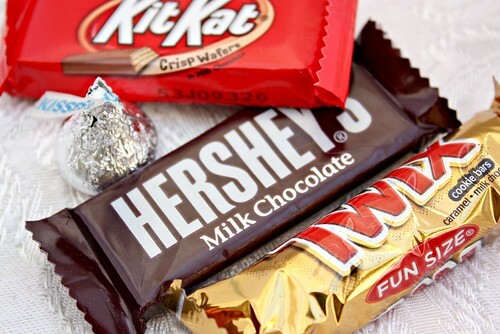 PLEASE don't use Hershey bars at all, but use Swiss, Belgian, German, or even English chocolate. You won't regret it. I live in Germany, and all my German friends says that they're always asked by American friends who are 'in the know' to bring chocolate from Europe over to the US as presents. I've lived in the US too, and frankly, Hersheys chocolate tastes like cardboard in comparison to European chocolate. I can't understand why they haven't gone out of business. I can only put it down to the fact that Americans are woefully ignorant about what's beyond their own shores. Hello! I just saw your blog and that wonderful chocolate cake!!! I was wondering if there is something I can use in place of the alcohol (Kaluha??). A chocolate syrup maybe? Allergy Foodie - thrive with top 8 food allergies! Get 300 bonus SB when you sign up for Swagbucks in April! © 2015 Art of Dessert. Simple theme. Powered by Blogger.